William Blake’s World: “A New Heaven Is Begun.” Morgan Library and Museum, 11 September 2009-3 January 2010. THE MORGAN LIBRARY’s Blake collection has long been one of the world’s greatest, beginning with J. Pierpont Morgan’s own purchases, notably enlarged by the collection of Mrs. Landon K. Thorne in 1972-73, and continued by further acquisitions, including gifts by the Morgan’s one-time director, Charles Ryskamp. The current exhibition, assembled by Ryskamp and curators Anna Lou Ashby and Cara Denison, features only part of the Morgan’s holdings, judiciously chosen and mounted with a refreshing lack of clutter or busyness. It is a rare collection indeed that can display such a great chronological range of Blake’s engravings, including as it does Morning Amusement after Watteau (1782) and George Cumberland’s calling card (1827). Among its rarities are a delicately tinted Canterbury Pilgrims (third state) and Satan (also aptly known as Head of a Damned Soul in Dante’s Inferno) after Fuseli. The latter, one of five known impressions, may have been privately printed for a few friends, as there is no indication that it was ever published for sale. In these selections we can also see Blake’s development from the pleasant commercial design for Thomas Commins’s Elegy Set to Music (1786), which could have been executed by any competent engraver (although the histrionic gestures of the figures are typical of Blake), to the engraved portrait of Wilson Lowry (executed by Blake with Linnell, 1825), that, as Robert Essick has shown, reflects the advance in techniques such as burnishing that Blake learned from Linnell (Essick 223), which was to bear greater fruit in Blake’s great Job engravings, four of which are mounted on a temporary wall. There is a special thrill for me, and I expect for many others, in seeing Blake’s manuscripts, even when they must be shown in transparent cases. In particular, Catherine Blake’s letter to Ann Flaxman, dictated to William on 14 September 1800, conjures up the image of William’s taking Catherine’s dictation as they both enthusiastically looked forward to moving to Felpham. Also present is the Pickering Manuscript, opened to “The Grey Monk” on pages 12-13. This holograph is dated to “about 1807” here, although on what grounds is not stated. It may be because of the date “1807?” given in G. E. Bentley, Jr.’s, chronology in The Stranger from Paradise (460). 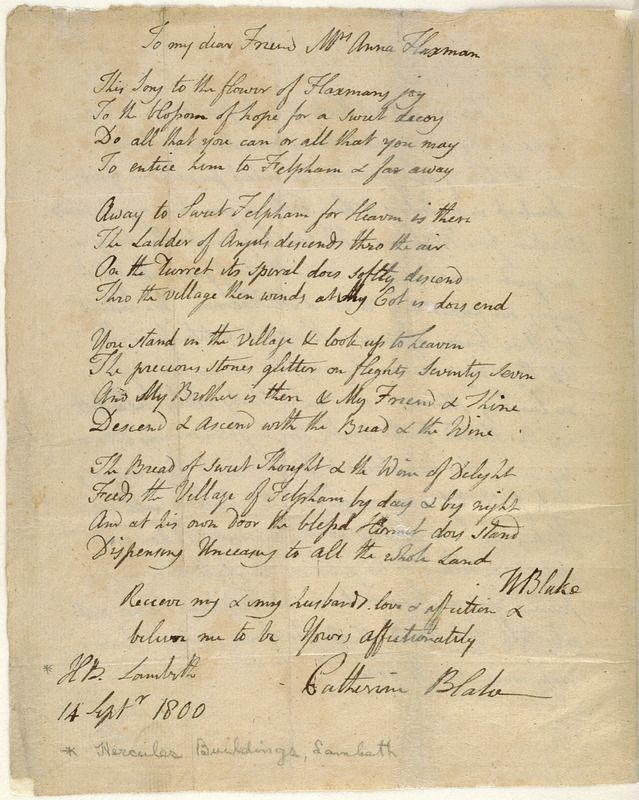 As far as I know, the only certain date, as Bentley himself has shown (“The Date of Blake’s Pickering Manuscript”), is the terminus post quem July 1802. There is also a letter here by William Cowper, whose correspondence, Blake wrote to William Hayley, “ought to be printed in letters of Gold.”1↤ 1. Letter to Hayley, 12 Mar. 1804 (E 743). A hallmark of the Morgan’s copies of illuminated books is the consistently excellent quality of their impressions. One section is entitled “Continental Prophecies,” the designation used in the 1995 Blake Trust edition of America, Europe, and The Song of Los, having apparently passed into general usage. Represented here are ten plates of copy A of America, remarkable for its beautiful coloring and white-line effects, four plates of Europe (copy G), and four of The Song of Los (copy C). The latter four are, in whole or in part, superb examples of Blake’s color printing, a mode he employed chiefly in 1794-96. Color printing presents textured surfaces that may be grainy, speckled, mottled, reticulated, or some or all of these. These appeal to our tactile sense as no reproductions can, making us want to commit the transgressive act of touching them. Among the illuminated books to be found in other display cases are copy F of The Marriage of Heaven and Hell (also color printed), the Flaxman copy of Songs of Innocence (D), printed in yellow ochre and delicately colored, and the intriguing copy K of Songs of Innocence and of Experience, not all of which is Blake’s, as its two plates of “The Tyger” are used to illustrate. The superstars of this show are, as one would expect, the Morgan’s two great series of watercolors: the illustrations to Milton’s L’Allegro and Il Penseroso and the Butts series of Job. The former are in almost pristine condition except for the last, “Milton in His Old Age,” where some flaking has occurred on the left side of and just above and below Milton’s head. As I looked at the written page in Blake’s hand for “The Spirit of Plato,” it occurred to me that we do not know what edition of Milton Blake used, and that a start might be made by comparing Blake’s transcriptions of Milton’s text with the likeliest candidates. Also, although there is an excellent edition of this series online at the William Blake Archive, it has never been published in a hard-copy facsimile. As the Morgan pioneered in the high-quality reproduction of Blake’s art with its facsimile edition of Job (1935), perhaps it would consider producing an edition of these at some future time. Second page of the letter from Catherine Blake, in the hand of William Blake, to Ann Flaxman, 14 Sept. 1800. Courtesy of the Morgan Library and Museum. Accession no. MA 6048.
time. A few sheep can be seen in the green foreground, but Job’s arms extend laterally, indicating scenes set in what appears to be a curving wall. Blake followed these latter details in his engraving, as he also did in the placement of the daughters, one leaning against Job on either side, and the third seated on the ground before him. In this indoor scene the sheep are gone. The daughters’ aspects, beautiful and pensive, differ from both drawings, in which they appear rather disconsolate. All twenty-one watercolors look wonderfully fresh, a tribute to the Morgan’s conservatorship. Books are at a disadvantage in art exhibitions, being limited to a single opening, and copy F of Jerusalem looks lonely in its glass case. Many who see it will not suspect that they are looking at one of Blake’s greatest accomplishments, and the last one assembled at that. The copy of Night Thoughts displayed has the advantage of size and color, very fine color that may well have been added by Blake (or both Blakes), as is claimed here, as a pattern for others to follow. A good example of Blake’s commercial engraving after other artists is in The Botanic Garden by Erasmus Darwin, opened to Tornado, after Fuseli. The lighting of the gallery is excellent, as is the physical arrangement of the displays. I suppose that when there is a crowd, it could be difficult to see the exhibits in the glass cases, but no one has ever succeeded in solving this problem for relatively small works. The wall labels are on the whole discreet (as they should be), informative, and placed at a comfortable height. There are a few minor errors among them, and one that is a little more than minor: “After his apprenticeship, Blake was admitted to study as an engraver at the Royal Academy.” Blake of course studied drawing at the R.A., but he did not do a stroke of the burin at an institution that looked down on engravers as manual workers. Although there is no catalogue, the entire exhibition is posted on the Morgan web site <http://www.themorgan.org/collections/works/blake>, so those who did not see this major exhibition can view it online, and those who did can refresh their memories of it, as I know I will. Bentley, G. E., Jr. “The Date of Blake’s Pickering Manuscript or The Way of a Poet with Paper.” Studies in Bibliography 19 (1966): 232-43. —. [e] The Stranger from Paradise: A Biography of William Blake. New Haven: Yale UP, 2001. Essick, Robert N. William Blake Printmaker. Princeton: Princeton UP, 1980. Rosenblum, Robert. Transformations in Late Eighteenth Century Art. Princeton: Princeton UP, 1974.